Sorry that was freakin cheeseboys fault, kept sending me his stupid game to help him with, its back up now. I can't manage to make it work. It says b2d_pause_enable does not exists even if I enable the extension in settings. Might want to file a bug report, or post on the forums, or he'll forget to fix it. For future reference, the reason it states that the function 'b2d_pause_enable' does not exist is because the function seems to have been renamed to 'b2d_pause_system'. 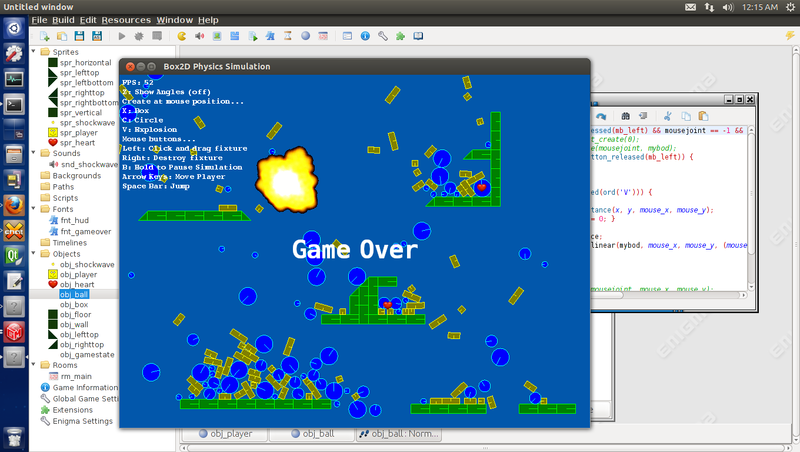 You can find the relevant function calls within the Begin Step event of the object 'obj_gamestate'. Just replace the calls to 'b2d_pause_enable' with 'b2d_pause_system'. ENIGMA - Write that down.